"Friends From Near and Far"
Acclaimed young choristers of the bay will join forces with the most exemplary voices of Europe to create an unforgettable night of beautiful harmonies, including a newly commissioned piece that commemorates last year’s devastating California wildfires, when the Ragazzi Boys Chorus shares the stage with the girls of iSing Silicon Valley and the Copenhagen Girls’ Choir in Friends From Near and Far. 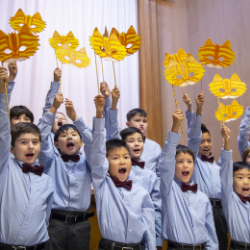 One of the Bay Area’s premiere arts organizations for boys, Ragazzi Boys Chorus has committed itself to excellence in musical performance and education for over 30 years. The award-winning choral organization iSing Silicon Valley brings together girls from diverse backgrounds to unite their voices in harmony and change the world through song. Joining the two Bay Area Peninsula groups will be the Copenhagen Girls’ Choir, Denmark’s leading girls chorus, internationally renowned for its broad repertoire and meticulously trained voices. This recital offers music-lovers a unique opportunity to see the boys chorus perform alongside two lauded girls choirs, during an evening of transcendent music. Tickets (Adults: $20, Children/Students: FREE) will be available at http://isingsv.com/calendar/or by calling 650-342-8785.